Ama Codjoe was raised in Youngstown, Ohio with roots in Memphis and Accra. She has received support from the Atlantic Center for the Arts, Blue Mountain Center, Cave Canem Foundation, and Callaloo Creative Writing Workshop. Her poems have appeared or are forthcoming in Narrative, Four Way Review, Prairie Schooner, Callaloo, and elsewhere. Ama is a two-time Pushcart Prize nominee. 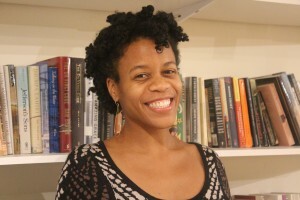 She received the Rona Jaffe Graduate Fellowship from the Creative Writing department at New York University where she is Poetry Co-editor for the Washington Square Review.